Welcome to the wonderful world of the Rustic Notebook collection from Lucy Ledger Ltd! Featuring luggage tags, roses, typewriter fonts and colourful twine, this design is chic, cute and oh-so romantic! Professionally printed onto 300gsm matt textured board, the first thing you’ll notice is the luxurious quality of the Rustic Notebook stationery. Choose from a wide range of gorgeous items including RSVPs, seating plans, table names/numbers, Save the Dates and even a Rustic Notebook wedding website! 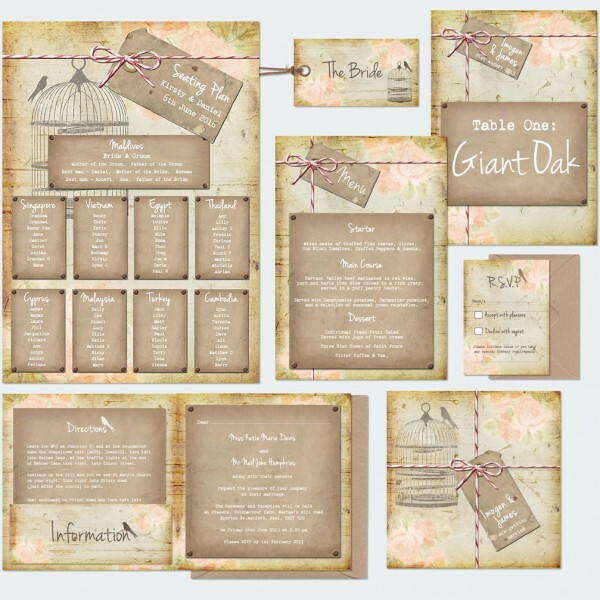 Each piece of stationery features a distressed wooden background adorned with a beautiful trio of roses – the overall effect is certainly one of rustic vintage charm. Although the Rustic Notebook design is printed onto one piece of board, the background has been designed to look like a noticeboard with several pieces of brown paper pinned onto it, perfectly showcasing your wedding information. If that wasn’t cute enough, some pieces feature a vintage birdcage complete with its very own little blackbird. You’ll notice that other stationery items in this range have the little bird sitting atop the significant words, for example ‘Directions’, ‘Information’ and ‘RSVP’, as an extra special touch. What’s more, some items have red and white twine and luggage tags printed on them to create even more of an eclectic, bespoke look. The super-duper designers have made good use of a typewriter font and teamed it with a handwritten style typeface for an authentic feel. One thing’s for sure, this wedding stationery design has so many lovely things going on, your guests will absolutely love it! Tags: Birdcage, Brown Paper, Luggage Tags, Roses, Rustic.